Ragnarok Online 2, launched May 1st , 1pm PDT, and in less than a week is ranked #1 Massively Multiplayer Online Role-Playing Game(MMORPG), in the Top 3 Free-to-Play Games on Steam with the 11th highest Concurrent Users at over 8000. Ragnarok Online 2, officially opened May 1st, allowing players from around the world access to the world of Midgard. The overwhelming number of players trying to register, download, and play took their servers to capacity and beyond. As a follow up to the successful launch, WarpPortal has announced a 20% Bonus Point Conversion Event across all WarpPortal titles, to last until the end of the month. 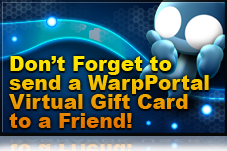 Players who transfer points to their Favorite WarpPortal title, will receive 20% Bonus Game points! BUENA PARK, Calif. (May 1st, 2013) – WarpPortal officially opens Ragnarok Online 2: Legend of the Second, at 3pm PDT today May 1st. More details and to join the Adventure: www.playragnarok2.com Client for the game will be available on the official site and downloadable via Steam. Ragnarok 2 is a free-to-play, fantasy MMORPG that takes elements from the original Ragnarok Online and re-images them as a three-dimensional, modern MMO experience. Commercial service to begin May 1st; and WarpPortal users will be able to download the client early from the Official site after registering, while Steam users can register and download the game via Steam. Ragnarok 2’s successful Open Beta, gave thousands of players plenty of fun exciting events to keep players ingame and excited. Their Commercial Service promises to be no different, with events and other launch day surprises to come. RAGNAROK 2: LEGEND OF THE SECOND OPEN BETA WEEKEND! “Ragnarok 2 Beta is now in full swing with tons of events! Ragnarok 2 will be performing Item Mall testing this weekend alongside a plethora of events players can participate in, both offering Items and rewards only obtainable in the Beta period! For more event details: http://www.playragnarok2.com/event/BetaOpenEvent.aspx .